Charles Babbage's Analytical Engine (portion of mill with printing mechanism). Image credit: Science Museum, (January 12, 2004). 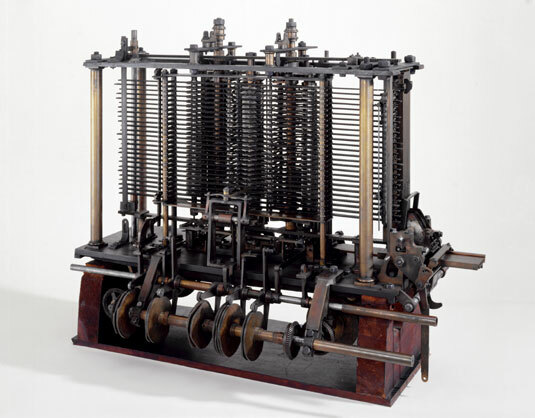 The distinctive characteristic of the Analytical Engine, and that which has rendered it possible to endow mechanism with such extensive faculties as bid fair to make this engine the executive right-hand of abstract algebra, is the introduction into it of the principle which Jacquard devised for regulating, by means of punched cards, the most complicated patterns in the fabrication of brocaded stuffs. It is in this that the distinction between the two engines lies. Nothing of the sort exists in the Difference Engine. We may say most aptly that the Analytical Engine weaves algebraical patterns just as the Jacquard-loom weaves flowers and leaves. Here, it seems to us, resides much more of originality than the Difference Engine can be fairly entitled to claim. We do not wish to deny to this latter all such claims. We believe that it is the only proposal or attempt ever made to construct a calculating machine founded on the principle of successive orders of differences, and capable of printing off its own results; and that this engine surpasses its predecessors, both in the extent of the calculations which it can perform, in the facility, certainty and accuracy with which it can effect them, and in the absence of all necessity for the intervention of human intelligence during the performance of its calculations. Its nature is, however, limited to the strictly arithmetical, and it is far from being the first or only scheme for constructing arithmetical calculating machines with more or less of success. 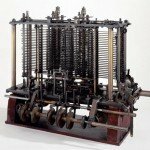 The bounds of arithmetic were however outstepped the moment the idea of applying the cards had occurred; and the Analytical Engine does not occupy common ground with mere “calculating machines.” It holds a position wholly its own; and the considerations it suggests are most interesting in their nature. In enabling mechanism to combine together general symbols, in successions of unlimited variety and extent, a uniting link is established between the operations of matter and the abstract mental processes of the most abstract branch of mathematical science. A new, a vast, and a powerful language is developed for the future use of analysis, in which to wield its truths so that these may become of more speedy and accurate practical application for the purposes of mankind than the means hitherto in our possession have rendered possible. Thus not only the mental and the material, but the theoretical and the practical in the mathematical world, are brought into more intimate and effective connexion with each other. We are not aware of its being on record that anything partaking in the nature of what is so well designated the Analytical Engine has been hitherto proposed, or even thought of, as a practical possibility, any more than the idea of a thinking or of a reasoning machine. — Ada Lovelace in the appendix “Note A” to her translation of Luigi Federico (L. F.) Menebrea‘s “Sketch of the Analytical Engine invented by Charles Babbage Esq.”, in Scientific Memoirs: selected from the transactions of foreign academies of science and learned societies, and from foreign journals, edited by Richard Taylor, Volume 3, (London: Richard and John E. Taylor, 1843), p. 696. "The distinctive characteristic of the Analytical Engine"
Posted on behalf of Ada Lovelace on Wednesday, March 24th, 2010 under Quotations. It’s great to see her own words. She sounds like one smart cookie. Happy Ada Day!